ESPN.com - E-Ticket: Who Knew? David Wells says in draft of book "Perfect I'm Not" that 25-40% of big leaguers use steroids. In published version, range is downgraded to 10-25%. Caminiti is only player mentioned. U.S. Anti-Doping Agency announces existence and history of THG, fingers BALCO as source. In February, Attorney General John Ashcroft announces 42-count indictment against Conte, Anderson and two others on charges of conspiracy, possession with intent to distribute steroids and money laundering. Senator John McCain tells baseball and football officials in March that Congress will intervene unless tougher testing is instituted. The San Francisco Chronicle reports on Dec. 2 that Giambi admitted to BALCO grand jury he used steroids and human growth hormone. 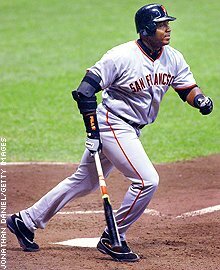 Next day, paper reports Bonds testified to using steroids unknowingly. Wally Joyner had a choice to make. This was his third spring training with the Padres, and the 1998 season was shaping up to be a good one. The team already had a trio of All-Stars -- Ken Caminiti at third, Tony Gwynn in right, Steve Finley in center -- and an intimidating closer, Trevor Hoffman. Acquiring Kevin Brown in the off-season to anchor the rotation made them the fashionable pick to win the NL West. Joyner was one of the team's most popular players, the kind of guy management dreamed about. GM Kevin Towers, Joyner's former teammate and roommate at BYU, compared him to Wally in Leave It to Beaver. "He was the good kid on the block," Towers said a few months after trading for him. Joyner was active in San Diego charities, played a superb first base and had hit .300 in three of the previous four seasons. But now, on a practice field underneath the blazing Arizona sun, Joyner was at a career crossroads. Yes, the team had picked up his $3.75 million option after a nice 1997. Then again, he'd hit only 21 home runs over the past two seasons, a long way from the 56 he'd hit as an Angel in his first two a decade earlier. Those home runs had helped make him runner-up to Jose Canseco in the AL Rookie of the Year vote in 1986 and had turned Anaheim Stadium into Wally World. Still, he'd told reporters he wasn't a home run hitter. And he was right; he hit more than 16 just once again after 1988. It didn't matter then, but it did now. In 1996, two players -- Mark McGwire and Brady Anderson -- had at least 50 home runs for the first time since 1961. (Anderson's career high to that point was 21.) That year, three teams -- the A's, Mariners and Orioles -- surpassed the 1961 Yankees' single-season record for home runs. The next year, McGwire forced a trade, rejoining his old Oakland colleagues, manager Tony La Russa and coach Dave McKay, in St. Louis -- and hit 24 homers in 51 games. The game was changing. [Wally Joyner] approached his friend after a workout and asked how he could get some steroids. [Ken] Caminiti didn't blink. He grabbed a piece of paper, scribbled a number and handed it over. "Call this guy," he said. Joyner was also just shy of 36 years old and beginning to break down. He was one of the game's early weightlifters, but his swing was rooted more in timing than in power, and he felt his bat slowing. His body, too. Strains and pulls he once shook off now took weeks to heal. Joyner had had arthroscopic surgery to ease patella tendinitis on his right knee the previous October, on the same day Caminiti had had his right knee scoped. Caminiti, 10 months his junior, always bounced back from injuries quicker than Joyner did. And Wally knew why. So on this March day, he approached his friend after a workout and asked how he could get some steroids. Caminiti didn't blink. He grabbed a piece of paper, scribbled a number and handed it over. "Call this guy," he said. Joyner adored his teammate. All of the Padres did, just as the Astros had before them. Cammy played the game hard, wrestling grounders into the dust before throwing lasers to first and making every at-bat count. His fierceness intimidated opponents -- and sometimes his own teammates. Once, when a veteran was griping too much, Caminiti turned to Padres manager Bruce Bochy. "You want me to take care of it?" he asked. "Don't beat him up," Bochy replied. That was Cammy. The ultimate teammate. He'd do whatever it took. And, man, could he play. In 1996, their first season together, Joyner marveled as Caminiti smashed 40 homers, knocked in 130, hit .326, played a Gold Glove third and won the NL MVP award. "He's so intense it makes the other players want to take their play to a different level," Joyner told reporters. But he saw the demons that plagued his friend. Most everyone knew about the drinking, and some suspected the drug use. It was an easy hole to fall into. Ballplayers wake up and can't remember what city they're in, the pressure to perform is relentless, pitfalls abound. Need a pick-me-up? Grab a greenie. Need to smooth out? The bat boy will grab you a beer. Steroids? A FedEx envelope will be in your locker tomorrow. Coke? The "green flies" -- what players call fans desperate to cozy up to big leaguers -- wait in the parking lot, the hotel lobbies, the gyms and bars. They have whatever you need. Joyner saw using steroids as cheating; he suspected Canseco and others were using and resented what they'd accomplished. But he didn't lump Caminiti with them. Like many of Cammy's close friends, he was happy the man was for once doing something to build his body up instead of tear it down. Joyner stared at the phone number in his hand. Everyone fights decline. He'd done it by taking more BP, studying more video, spending more time in the weight room. But that wasn't working anymore. He made the call. A man answered, they exchanged a few sentences and Joyner hung up. The next day, Caminiti handed him one of those flimsy overnight packages Joyner had learned to recognize. It was from the man he'd called. "This is for you," Cammy said. Joyner took the package, went back to his apartment and opened it. Inside was a small bottle filled with pills; he didn't know what they were called. Caminiti had given him instructions on how to use them, though. Joyner carried the pills around for a few days, sometimes taking one out to stare at it. Finally, he took one. The next day, he took another. "What am I doing?" he asked himself. Ten days passed before he took a third. The Cactus League was going well for the Padres. Brown looked sharp, Caminiti looked strong and leftfielder Greg Vaughn looked ready to rebound from a subpar season. But the normally upbeat Joyner was somber. He hated what he was doing, hated how dirty he felt. In his apartment after a workout toward the end of spring training, he rethought for the hundredth time the choice he'd made. He'd played 12 years in the big leagues, 12 great years. Why ruin that? He walked into the bathroom, held the bottle over the toilet and turned it upside down. The pills made a pile under the water. He flushed. The next day, Joyner sought out his friend. "It's not for me," he said to Caminiti, and walked away.